I love my new job. I am two weeks in and I am loving the challenge, the people and the fact that (due to London real estate weirdness) I am now in the same building as the hub. Due to this, and the shift in his working hours, we’re now able to do the London thing and take better advantage of the many restaurants the city has to offer. Today we are finally visiting Barrafina on Adelaide Street, the only place in London where I’ve been able to find lamb’s brains on the menu. Of course this is no flying visit to try lamb’s brain. It feels weird enough to order and eat lamb’s brain in public. 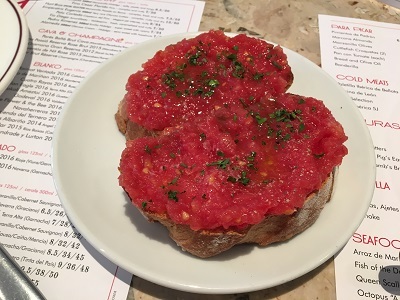 After all, Barrafina is one of those restaurants that always has a massive line – it’s just that we can go there mere minutes after it opens and have our choice of seats. 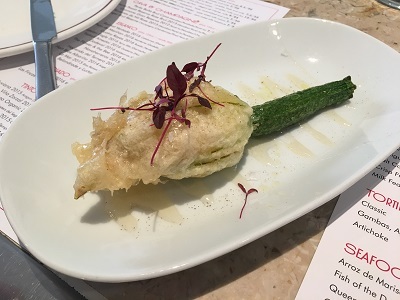 So we picked one in front of someone that we deduced to be the head chef and just enjoyed watching food being made as we waited for our order – which included a huge stuffed courgette flower and pan con tomate. The lamb’s brain arrived after we’d finished everything else, not that you could tell that was brains… until you cut it open. It sounds a bit pathetic to be both excited and squeamish at the same time – but eating brains feels like crossing some sort of gastronomic line, similar to the first time you cook live shellfish or cooking a bird that still has its feathered head attached. In terms of taste there really is not that much to brains. It has a very vague protein taste, much like the white albumin you get after cooking a fish fillet, that is incredibly mild. 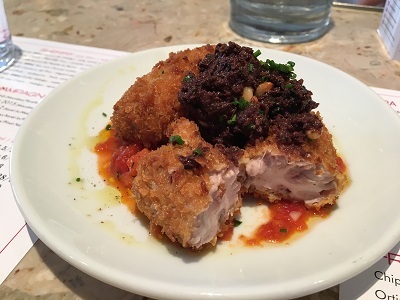 As such it makes sense that Barrafina decided to serve it topped with tapenade on top. Together the brains, tapenade and the tomato-celery sauce made for a good plate of tapas. One thing that did live up to expectations was the texture. As a science student I remember stroking an embalmed sheep’s brain like a Bond villain, but then being told how a brain’s texture is more like porridge. This lamb’s brain fritter really did have the texture of cold porridge, but with the creaminess of quark.